When your grandchildren go out to lunch many years from now, they'll probably still be able to order fast-food burgers and fries, but the meal -- and the people serving it -- will likely be very different. Decades ago, McDonald's was the quintessential American restaurant. Now, as the "golden arches" fall out of favor -- the chain's U.S. eateries have suffered from months of flat or negative same-store sales, an important metric of a retailer's health -- a new type of burger joint is taking its place. These "better burger" restaurants, a category that includes Shake Shack, Smashburger and Five Guys, are known more for their quality offerings, trendy aesthetic and exclusive air than for low prices. The group makes up just 4 to 5 percent of the burger segment, but its sales are growing at a rate of about 16 percent, according to Darren Tristano, an executive vice president at food research firm Technomic. At the same time, the burger industry overall is contracting by about 0.8 percent, adjusting for inflation. As Shake Shack reportedly prepares to ride that wave of popularity into a successful initial public offering, the question remains whether the company can maintain another one of its signature initiatives: treating its employees well. In the service industry, private companies are more likely to offer meaningful jobs that pay well than their public counterparts are, according to Zeynep Ton, a professor at MIT's Sloan School of Management who does research on low-wage jobs. Public companies "have more short-term pressure from their investors," said Ton, the author of The Good Jobs Strategy. Indeed, John Pepper, the co-founder of burrito chain Boloco, told The New York Times last month that when he raised wages at his restaurants to $8 an hour from $5.15 several years ago, he didn't have to worry as much as his public competitors about maximizing profits immediately. The NYT story, which highlighted restaurant chains that pay their employees above average, also featured Shake Shack, where workers reportedly earn at least $9.50 an hour and the median pay is $10.70. Despite public companies' focus on maximizing profits, it's not unheard of for them to pay well, Ton said. She cited Costco and its co-founder, Jim Sinegal, who was known for standing up to investor pressure for lower wages. Ton argues that companies that treat their employees well, such as Shake Shack and Costco, actually gain an edge over competitors. Her research shows that training workers and paying them a decent wage means they're more likely to be knowledgeable about products, answer customers' questions and ultimately drive sales. "Investment in people could be a huge success driver," Ton said. For Shake Shack, there's an added incentive to keep treating workers well: It's one of the reasons customers flock to the restaurant. Tristano of Technomic said by paying more, Shake Shack attracts better and more experienced workers who add another element of quality to the eatery besides just the food. That helps to differentiate the company from more traditional fast-food chains, which have been criticized in recent months for their low wages as well as their cheap and unhealthy food. The Shake Shack experience is "far more memorable," Tristano said. "When you're charging more and you're certainly paying more rent because you're in great locations, you have to treat your employees with the same respect. You have to have the service level that brings the whole thing up full circle." 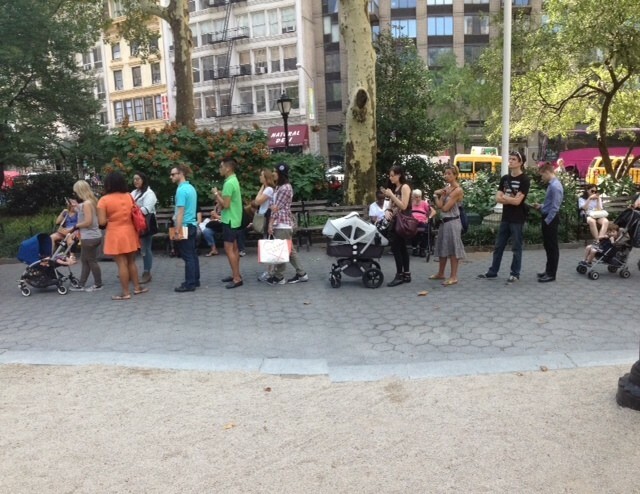 The line outside the Shake Shack in Madison Square Park on a recent weekday afternoon. Indeed, Shake Shack's reputation for quality lured customers from as far away as France to its half-hour-long line on a recent afternoon. Those asked all agreed they would never wait for food at a traditional fast-food eatery such as McDonald's. Robby Wecksler, a 21-year-old Cornell University student waiting in line with his friends, cited the quality of the staff specifically as one of the big reasons he comes to Shake Shack, adding that it always seems clean and "well managed." "The focus on the customer service is definitely noticeable," he said. In addition to attracting customers, paying workers well helps to create a positive buzz around the company, which could help it make money and deliver good returns to shareholders. 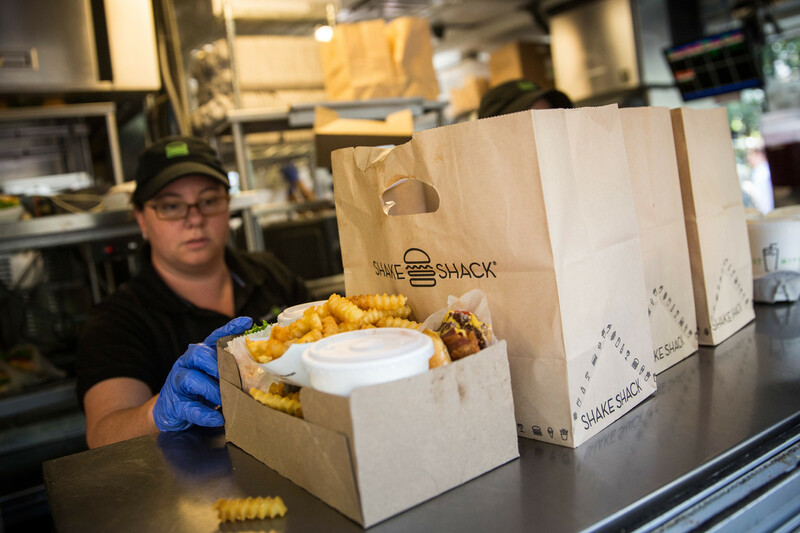 Estimates currently put Shake Shack's revenue around $100 million a year. A Shake Shack spokesman declined to comment on "any rumors or speculation around going public." The eatery's public relations approach has successfully attracted so-called earned media attention (like that New York Times story), which puts less pressure on the company to pay for advertising, according to Aaron Allen, the founder of Aaron Allen and Associates, a restaurant consultancy group. The strategy mirrors that of other successful restaurant chains such as Chipotle and Starbucks, which try to highlight their ethical streaks by emphasizing things like employee benefits and a commitment to quality ingredients. Neither have had trouble living up to shareholders' needs. Sales at stores that were open at least a year -- a closely watched measure of retailer health -- grew 6 percent at Starbucks and 17.3 percent at Chipotle last quarter. "This is a testament to the value of modern-day public relations," Allen said.